About The Artist: Jeff Eisenberg is an American Society of Composers, Authors and Publishers Award Winner and practicing speech therapist for toddlers and school age kids. 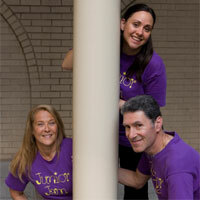 He created Junior Jam over 12 years ago as an outlet for offering children the opportunity to explore music while developing language and signing skills. He is a five time ASCAP Award recipient, as well as, a NAPPA and Children’s Music Web award winner for his Junior Jam CDs. His fourth CD entitled “Wake Up” was released January 2010. Adrienne Asterita is a professional actress and singer with experience in Theatre, Film, TV and now Music! She has worked on other children’s albums, and is currently recording her own original rock/pop music. Adrienne is also a regular singer of The National Anthem at Madison Square Garden for various College Basketball games and events, and has also sung at Shea Stadium for the Mets and Giants Stadium for the NY Red Bulls. Adrienne has a BFA in Drama from NYU’s Tisch School of the Arts, and is a member of both the Actors Equity Association and the Screen Actors Guild. When Adrienne is not acting or singing, she enjoys working with children at the Afterschool and Summer Camp programs at the Little Red School House in Manhattan. Elayne Kessler Elayne Kessler has been performing live shows with Junior Jam for the past 12 years. She begun recording on Junior Jam CD’s with the groups’ 3rd CD released in 2003. Elayne has been performing her Cabaret act for the past 15 years in both Florida and New York City. A former teacher of the deaf for 25 years, Elayne is also a sign language teacher who teaches sign language using a song-based curriculum she has developed. Elayne lives in New York City with her daughter and cat.